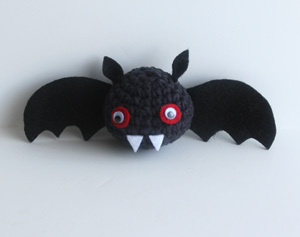 Here is another Halloween pattern, a little vampire bat! 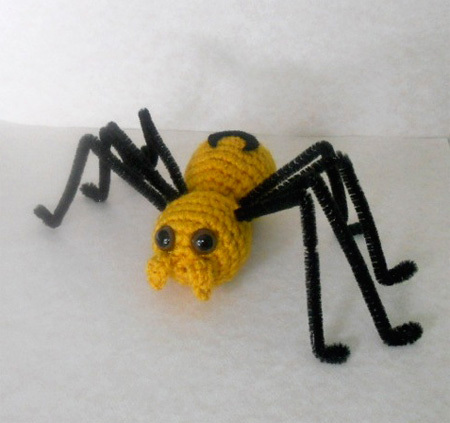 Easy and perfect for beginners, it doesn’t take long to make, but is still very cute! Fasten off, embroider yarn in rest of the stitches to close the hole. – Cut 2 circles in red felt, and glue on the body. 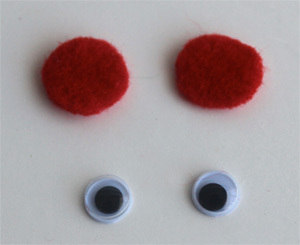 Glue the goggly eyes on the felt. 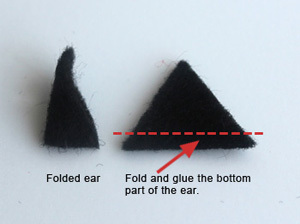 – Cut 2 triangles in black felt to make the ears. Fold and glue the bottom extremity together. Glue to the ears to the head. 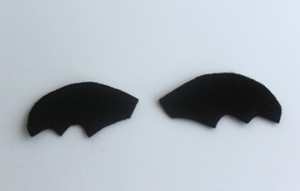 – Cut the pieces of black felt and shape them as bat wings. Glue the extremities to the back of the bat. I hope you enjoyed this pattern as much as I enjoyed creating it! * goggly eyes are small parts and therefore not suited for small children, in that case you can use felt instead. – at this point, insert the eyes if you use the safety ones. Fasten off, embroider the remaining thread into the rest of the stitches to close the hole. Fasten off and embroider to the head, below the eyes. Cut a piece of felt in the shape of a moon, and glue it on the body. Voila! 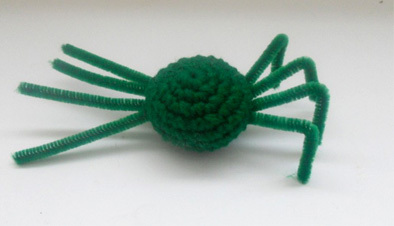 you’re spider is done. I hope you enjoyed this tutorial, and if you have any questions, don’t hesitate to ask me! 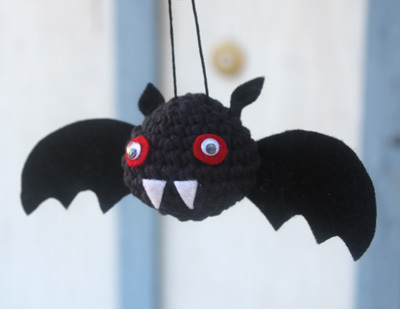 Halloween is just around the corner, and you don’t need to be super crafty to create really cute things to decorate for that time of the year. 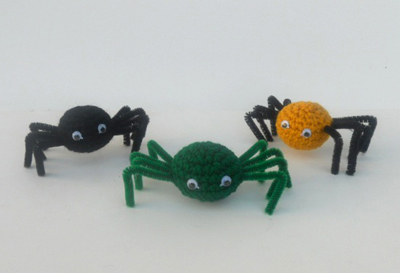 Here is a crochet tutorial to make some really cute little spiders to crawl all over your house! It’s very simple, very easy, and you can make a bunch of them in no time. The kids will love them! Cut 4 pieces of chenille stem, about 5 inch long. Insert them in the stitches of the last row on each side, then fold them in two. Fasten off, weave the rest of the thread into the remaining stitches to close the hole. Glue the *goggly eyes on the face. Bend the legs to form the shape of the legs. 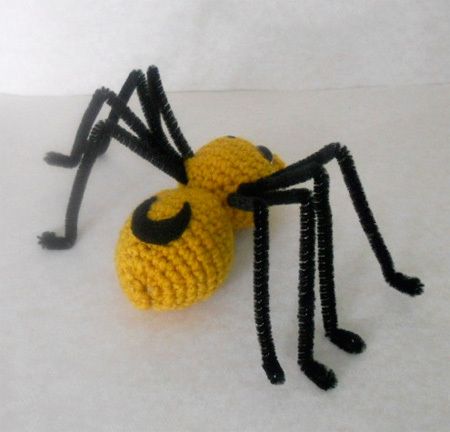 Your spider is done! You can have a lot of fun with this: play with different colors, add eyebrows, or a mouth. 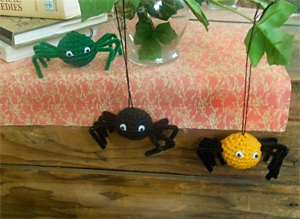 You can also Insert a piece of embroidery thread on top to hang you spiders. I hope you enjoyed this tutorial! Happy crocheting! *Technically, goggly eyes are adhesive and should not need glue , but it doesn’t hold very well without extra glue.